Premier Health’s CareFlight Air and Mobile Services hosted a Drive Smart program at Arcanum High School. DAYTON – Premier Health’s CareFlight Air and Mobile Services once again will launch its Drive Smart program at Dayton region high schools. 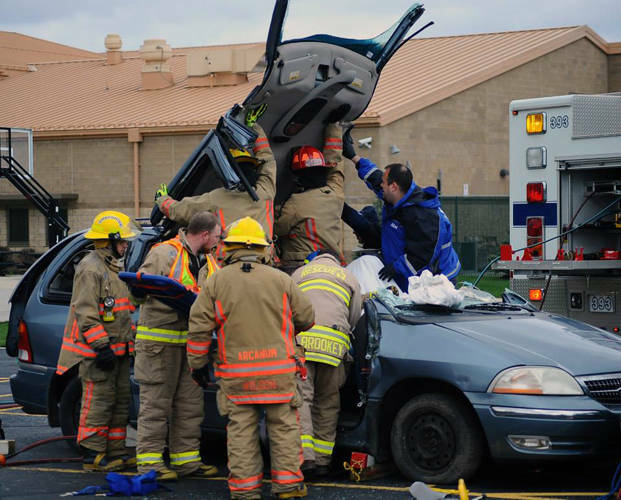 For more than 20 years, CareFlight has offered Drive Smart, a nationally recognized mock crash program that gives high school students a real-life look at the consequences of poor choices before getting behind the wheel of a car. In collaboration with Miami Valley Hospital and Atrium Medical Center Trauma programs, area fire departments, law enforcement, dispatchers, EMS, etc., the Drive Smart mock crash involves a scenario with two wrecked cars that are staged to represent a crash scene immediately following a motor vehicle accident. A total of 20 student actors are involved in the mock crash. The mock crash is narrated throughout, and all events occur in real-time, with emergency radio traffic and phone calls made audible for the entire audience. The scenario begins immediately after the crash occurs with bystanders calling 911 and progresses with the dispatch and arrival of police, fire and EMS, the extrication of victims from the vehicles, the dispatch and arrival of the CareFlight helicopter, the transport of the injured crash victims, the arrest of the intoxicated driver and finally the removal of the deceased victim by the coroner with placement into a hearse. At the conclusion of the scenario, a parent who has lost a child in a similar situation speaks to the audience, giving an emotional and sobering testimony to the realities of impaired and risky driving. The objectives of the Drive Smart are geared toward raising teen awareness of the dangers and consequences of bad decision-making, specifically drinking and driving, driving/riding without a seatbelt, texting and driving. Drive Smart is free to area high schools. Approximately 30 high schools participate each year.